rainbow gem ring / Rainbow jewels is one of the hottest trends in jewelry right now! This statement ring is SO perfect for the holiday season! resin hoop earrings / Resin/acetate jewelry is another popular jewelry trend - I love how these hoops also have a druzy stone for a touch of glam! These will go with almost everything! teddy coat / Teddy coats are officially a wardrobe staple for the winter season! This cozy number comes in 4 colors and is under $50! winter cookbook / Okay, how pretty is this cookbook?! But hey, don’t judge a book by it’s cover, right? (Too late…) The cookbook is full of cozy, comfort food recipes - Would be cute gifted with your recipient’s favorite bottle of wine.. hello, date night! mini palette / This little palette is under $25, perfect as a stocking stuffer! The colors are so pigmented and beautiful for a holiday makeup look! I own this, and LOVE it for this time of year! sweater / Hands down my favorite sweater of the season. So soft, perfect length for leggings or tucking into denim + Comes in a bunch of colors! velvet clutch / This clutch is stunning! I have a thing for collecting clutches - It’s the perfect way to jazz up outfit for the holidays or a night on the town. With the velvet and bow detail, this baby is no exception. 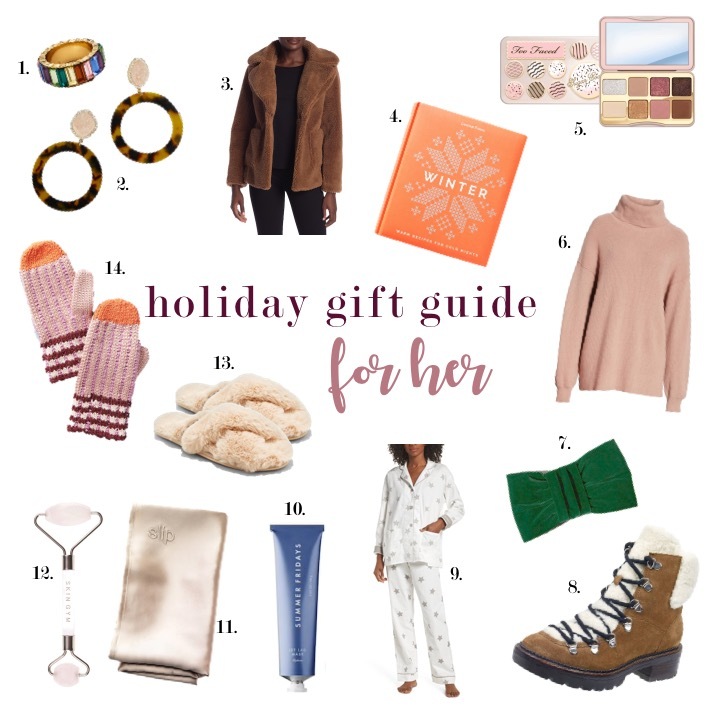 hiker boots / Hopefully Santa checks out my gift guides this year because these hiker boots are on my wishlist! NEED! jet lag mask / Another great stocking stuffer! I’ve yet to try this mask, but have heard nothing but great things! You can leave it on overnight for extra hydration for dry, tired skin. silk pillowcase / Using a silk pillowcase is one of my weapons for clear skin and managing second, third (…fourth) day hair. The hype is real! More affordable version, here. rose quartz facial roller / Facial rollers promote lymphatic drainage (reducing puffiness) and boosts collagen production - Perfect for this time of year when our skin has a tendency to show our lack of sleep and what we’ve been eating (and drinking). Would be nice gifted with your favorite serum! slippers / I mean… look at these slippers. Have you ever seen anything cozier?! Me neither. Bonus: They’re under $20. mittens / These knit mittens are so adorable + come in two other colors.